In a time of tranquility, we drop a real bomb. We make History with something never seen before, by bringing electronic music directly to the icon of culture in Lisbon. Yes, we are talking about the Centro Cultural de Belém. Gilvaia stands side by side with Ramboiage on the effusive anniversary of this nocturnal concept. The hours of dawn will be extended in Lisboa Rio to the sound of these artists who almost turn into a duo on April 30. On April 30, we celebrate the anniversary of a concept that we wanted to bring along the Tagus, in a venue that combines the best that Lisbon offers and the best of night life in the city. May many other Fuse All Nights come in Lisboa Rio. There are concepts whose fame goes beyond barriers, and Fuse’s birthday is one of them. 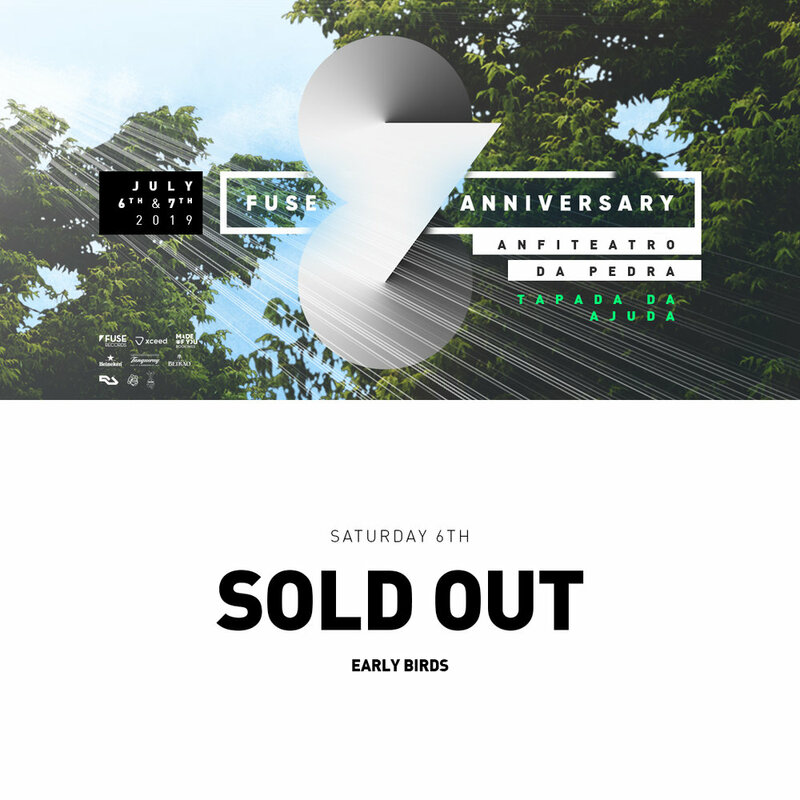 One day after the event’s release, the early birds for Saturday sold out. Thanks for the vote of confidence. We remind you that there are still early birds for Sunday, July 7! They say that time is fleeting that everything is ephemeral and without noticing, eight years have passed. An existence full of good moments, exhilarating moments and a roller coaster of emotions. And they say life is 2 days. Your Fuse’s birthday, too. On July 6 and 7, the tradition repeats itself in the Amphitheater of Stone, in Tapada da Ajuda. It’s going to be 2 afternoons of partying with the best we can prepare for you. Incredible as it’s been 2 years of Fuse All Night. On this special anniversary night, we bring together all the artists from Fuse who have participated in this concept in the 2 floors of Lisboa Rio. An authentic feast by the river Tagus. Even in Porto we couldn’t fail to follow our rituals. After the matinée at Boulevard, the hours of music don’t run out and we continue the party from Lottus. Entry is free until 1am for the Fuse matinée bracelet holders. Today’s our debut in Porto. Post your photos with the hashtags #fuseday #fusematine and @fuserecords. We ask you to come early. There’s ATM and cloakroom at the venue. See you soon! With a scheduled matinée in Porto, we couldn’t fail to invite a local to share some of his music with us. Ruben da Silva shows his charms at Boulevard with an enthusiasm and dedication that we could only attribute to him. 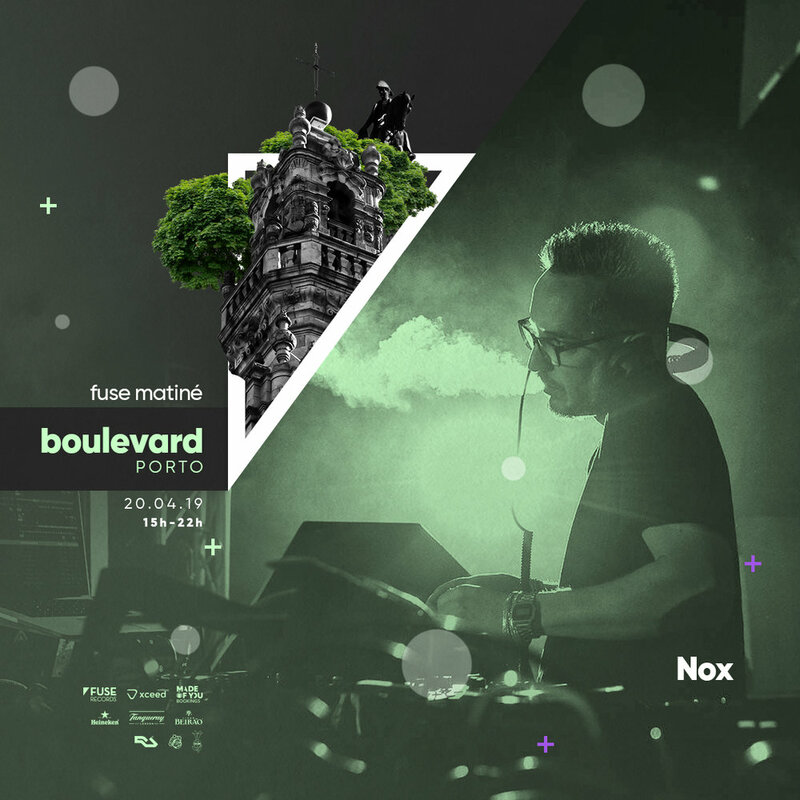 On the debut of Fuse in Porto, Nox completes the line up for this matinée taking place in Avenida dos Aliados. For a day, the artist joins a cause against a common enemy: inertia. We’ll meet you on the dance floor.